With 1 in 100 people in Ontario living with epilepsy, businesses across the province are realizing they need to know how to respond and assist their customers and employees who could have a seizure in the workplace. The EnAbling Change Program, through the Accessibility Directorate of Ontario, has partnered with Epilepsy Toronto to develop epilepsy@work, an internet-based educational resource, unique in Canada. Designed with businesses and employers in mind, it aims to help address and better manage the needs of employees and customers with epilepsy in this province. 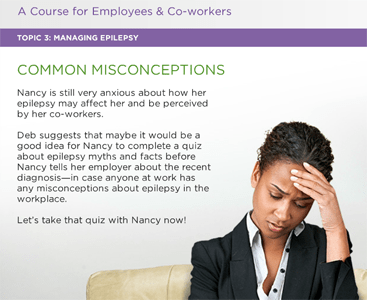 The epilepsy@work toolkit has been developed by epilepsy employment specialists, physicians, disability and HR professionals, and people living with epilepsy to provide a learning system that is informative, realistic, and engaging. designed eLearning course, suitable for co-workers and associates featuring a realistic workplace scenario, valuable material about different seizure types and how to accommodate an employee with a disability, and an automated course certification. First aid resources and a fully interactive video-based simulation of a seizure incident in a customer service environment where the user guides the responses of the participants. Information designed for Human Resources Professionals and Managers, including just-in-time resources and tools. Access to course materials via the internet or Learning Management System software. Visit www.epilepsyatwork.com to find out more.